Bamyan (Persian: بامیان Bāmyān‎), also spelled Bamiyan and Bamian, is the capital city of Bamyan Province, Afghanistan. It has about 61,863 people. It is the largest town in the Hazarajat region in central Afghanistan. 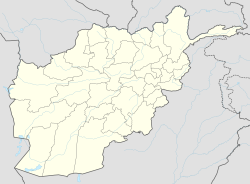 It is 240 kilometres north-west of Kabul, the national capital. Bamyan has the region's only university, Bamiyan University. This page was last changed on 8 September 2018, at 19:19.